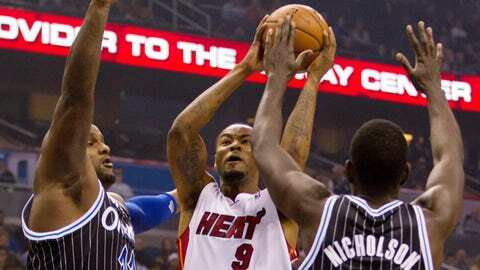 Miami Heat forward Rashard Lewis scored 18 points against the Magic in Orlando, where he played for three-plus seasons. ORLANDO, Fla. — This wasn’t quite the throwback the Orlando Magic envisioned. It didn’t go as far back as the replicas of the black uniforms with white pinstripes from the franchise’s formative years that they wore Saturday night against the Miami Heat. This nostalgia trip involved memories of when Rashard Lewis and a host of teammates would hover around the 3-point arc and wait for Jameer Nelson or Dwight Howard to find them open. Lewis now wears a Heat uniform. And with Shane Battier unavailable because of a bruised quad, the NBA veteran of 16 years left his former team feeling a bit bruised by going 3-for-6 from long range on his way to a season-high 18 points. "It was almost like perfect timing," Lewis said following the Heat’s 110-94 victory. "You don’t wish nothing bad on one of your teammates to get hurt. But (coach Eric Spoelstra) called my name to come out and start tonight, and I went out and played well. I’m very happy about that, especially playing in front of these fans." Lewis did all of his scoring through the first three quarters and also finished with four rebounds, three steals, two assists and a blocked shot. He did his share of carving up the Magic the night after having dinner at a steakhouse near where he used to live in Winter Park and being greeted by no lack of well-wishers. "It brings back a lot of memories of when I played here and had a lot of fun," he said. "It’s always fun, especially when you get fans saying ‘we miss you’ and ‘welcome back.’ That always gives you a good feeling." 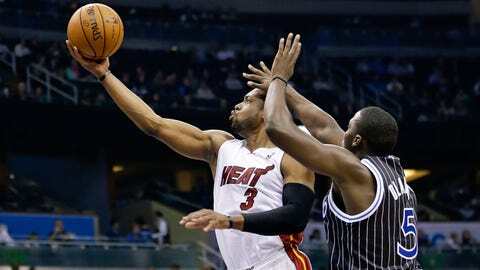 Heat Check: Charlie McCarthy breaks down how Miami was able to come out on top in Orlando. Recap: Dwyane Wade and Chris Bosh each score 20 to help the Heat send the Magic to their eighth straight loss in the series. Lewis came to the Magic in the summer of 2007 from the Seattle SuperSonics. Two years later, they reached the Finals. But a week before Christmas 2010, he was traded to the Washington Wizards for Gilbert Arenas, a deal that played a huge role in the eventual exit of Magic general manager Otis Smith. Other than Nelson, no one remains from that magical run of 2009. "Even though the team is much different, I’m sure it never gets old to beat your former team," Spoelstra said. "And even though he probably wouldn’t say it, it probably is special." Lewis scored the first six points of the Heat’s 15-0 explosion during the third quarter, which allowed them to seize control. Four of them came when LeBron James found him open in the corner and Lewis let it fly with Tobias Harris bearing down on him. The basket and subsequent free throw gave the Heat a 64-59 lead. Their advantage grew to 14 points two minutes later, and the Magic never got any closer than within nine points of them the rest of the way. "I saw (Harris) closing out on me pretty hard, and I just went up for the shot," Lewis said. "He kind of ran up underneath me. I’m just glad I made the shot, especially when he hit me." A case can be made for Lewis, during his years in Seattle and Orlando, paving the way for players like Harris who can play either forward position and hoist 3-pointers without hesitation. "A guy his size that can shoot the 3 ball and play either the 3 or 4, you want guys like that on your team," said Harris, who ended up with 17 points and 10 rebounds but was only 1-for-5 from 3-point range. "He had a great night tonight. He was a real boost for them." Learning how to provide that boost after years of being a starter was a challenge for Lewis, who ranks seventh on the NBA’s all-time list for 3-pointers made, after coming to the Heat. Watching Mike Miller flourish in a similar role during his time in Miami served as a template for him. "This year is a lot easier because I’m adjusting to it," he said. "I know on a veteran team, it can be any guy on any given night. You’ve just always got to be prepared and be ready when your name is called." Added Spoelstra: "That’s part of the depth we talk about. It’s not easy to have those guys on your bench that aren’t necessarily playing on a night-to-night basis but are keeping themselves ready. And when we need them, they step in and they can perform." When that happens in a city where Lewis once called home, it’s that much sweeter.